Doing a Clinic Near You? 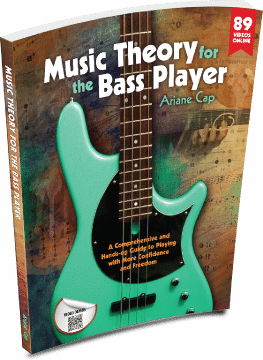 Home / Music Theory for the Bass Player / Doing a Clinic Near You? Big thanks to Shaana and Bananas at Large in San Rafael for putting today’s clinic on! Cheers to everyone who came out to join me for two hours straight of music theory talk, technique talk, pedal talk, “beautiful practice” talk… We went through a lot of topics and playing and I had prepared materials for download for everyone. After the clinic a few attendees joined up with me for a cup around the corner. I am always amazed at the variety of bass players one may encounter: We had a Ubass player who is the only bassist in a room with 40 other ukuleles. And other flavors of bassists and guitarists. If you have a favorite bass store and would like me to do a clinic there, please contact us! We are currently booking a “playing, book and wall chart” tour. A day of bass spent with bassists from all corners of California (and beyond, one attendee from Germany!). That was a great Sunday! Thanks Ari it was great and also fun to grab a coffee after. I’m sure you’ll be a great baby sitter for my kids in order to give me more practice time. lol, I hear you. Don’t wake them when they snooze…. pst!! Super nice to meet you yesterday! Thanks for coming! Thanks so much for the clinic yesterday. It was wonderful and you are as delightful in person as online. Sorry had to miss the post-clinic festivities, didn’t get home until 9. Midpines is further away than Mountain View, Germany! you crack me up, Mountain View Germany! But you are right, I should have mentioned the Midpines 4-hour commute!! Thank you for coming all the way, it was great to meet you! Traffic was gnarly yesterday all around the Bay, so super thumbs up for facing it in order to attend. Loved having you at the clinic! …Oh and also signed up for your full course now so I’ll be “virtually” meeting with you in the mornings while they sleep. Thanks again.